Okieladybug's Scrap N' More: It's Not My Corkscicle! There are so many brands of the stainless steel tumblers it's hard to keep up! A few days ago when I was out at McCall's one of women out there liked how I had my name on my stainless steel tumbler and asked if I would do hers. I have been avoiding doing the stainless steel like mine because it's not a true smooth surface and like I said a few days ago I don't want people complaining about the vinyl coming off. 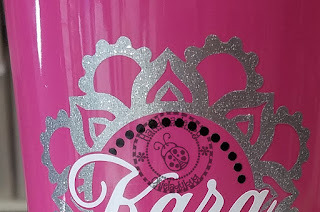 I'm not sure if everyone has seen the Corkscicle brand but they come in some really cool colors and the one the woman had was a hot pink *okie thinks that is obvious by the picture* and I told her I would sacrifice some of my glitter vinyl to do her cup. The mandala is one that my friend Carmen did and was nice enough to share with me. I didn't ask her if I could use it to make money off of it but if she doesn't like it then she can *okie falls out her chair laughing*. I was able to use the conical warp feature in Make The Cut to have the image come out looking straight after it was applied to the cup. For those folks who don't have the conical warp feature I really feel for ya because you have no idea what you are missing out on!! The image was only 3 inches across so you can imagine how small the dots are and I did a reverse weed, where you put the transfer tape down on the whole image and then remove the waste, with the dots. You might notice the slight empty space between the lettering and design and I used another fantastic feature in Make The Cut for that effect. I made a slight shadow of the name and then used the Boolean Join feature to cut way the area so the whole design lays flat instead of having it layered. I guess I better get busy on finding some more projects to work on because as I am writing this I have nothing else, zilch, nada to post! 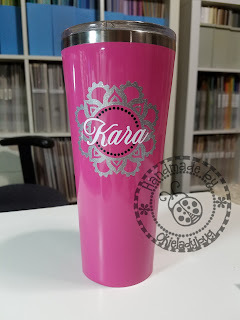 This tumbler came out freaking awesome!! The mandala on the hot pink is fabulous!! Amazing work, Shirley!! Very nice. Love the font. It's gorgeous ... you did an awesome job Shirley (as you always do). 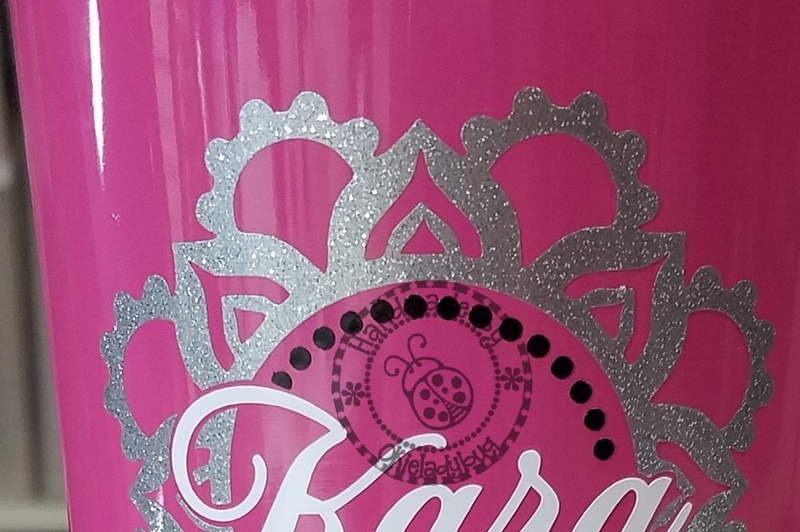 I have no doubt that the lady receiving this tumbler is absolutely delighted on how great it turned out. I hope she cares for it well, especially when cleaning it, so that it continues to look this beautiful for a long time. Nice job! I have to say you've intrigued me with Make the Cut now. I downloaded it a long time ago and then my computer died and never installed it on this one...so...I think I see Make the Cut in my future! LOL!